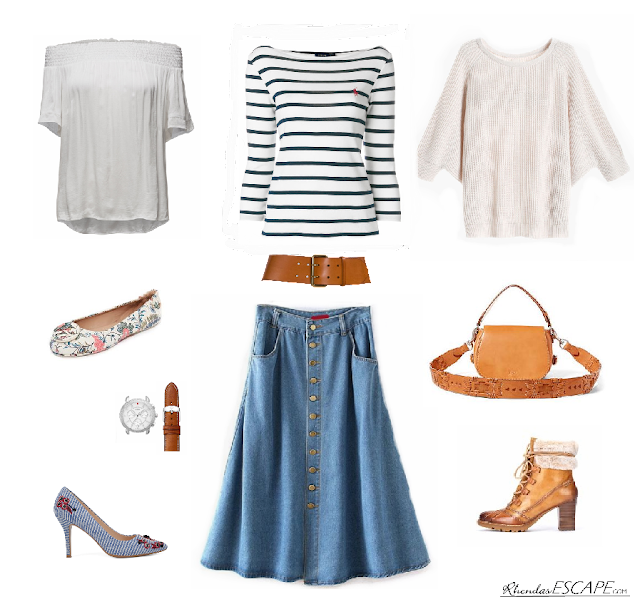 If you are not careful, a long denim skirt can give the "old church lady" or kindergarten school teacher look. Not that there is anything wrong there, but just not me. I do love the casual country look of denim and know there must be a way to make this fashion choice work. I seldom wear long skirts and typically will wear short pencil or flirty a-line skirts when not wearing pants/jeans. All of the above item are in my closet including this long denim skirt. I am working to justify taking it to be altered, so I'm trying to match it with cute youthful tops or sweaters. Sometime it is fun to shop your closet plus mix-n-match is such a feminine differential. What is in your closet? If I do take it to be altered, I will post photos of how I matched it up. Any of the above combinations will be perfect for a mid-fall trip coming up the end of October and will work for flying. This Florida gal is ready for an escape trip and a cool break away from the continuing Florida summer.